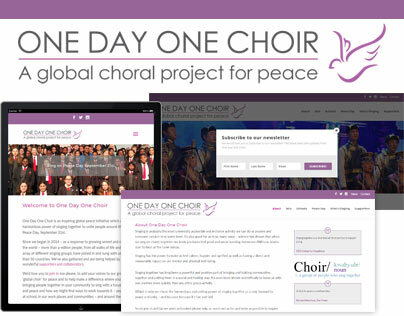 Under the Kaydee Web Ltd corporate social responsibility I was really pleased to complete the web design for One Day One Choir, a global singing initiative for peace. I was inspired by Jane’s enthusiasm for this project, and impressed that such a thing as singing could really bring a global community together in the name of peace. Something so many of us want. So I got involved with the web design for One Day One Choir. It was necessary that the site was update-able in-house and easy to use across all platforms, but there was a lot of information to fit on each page. An important feature is the WHO’S SINGING map, for which we used Google Maps. Jane can update the map herself as groups ‘sign up to sing’. A blog area has been provided so that Jane can keep followers up to date. I set up a MailChimp newsletter signup form and newsletter template to enable Jane to send out regular campaigns.